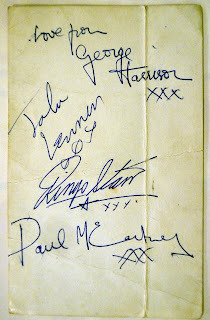 This is a rather unusual autograph from the McCartney boys. 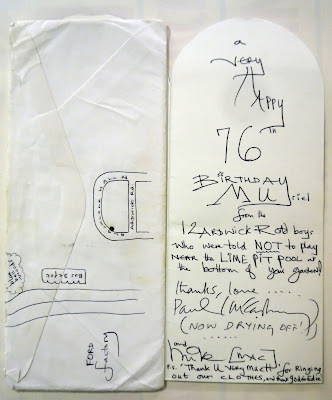 It is a birthday card for a lady called Muriel. She was a neighbour when they lived in Ardwick Road and it seems that she and her husband saved Paul and Mike from a flooded Lime Pit at the end of their garden. 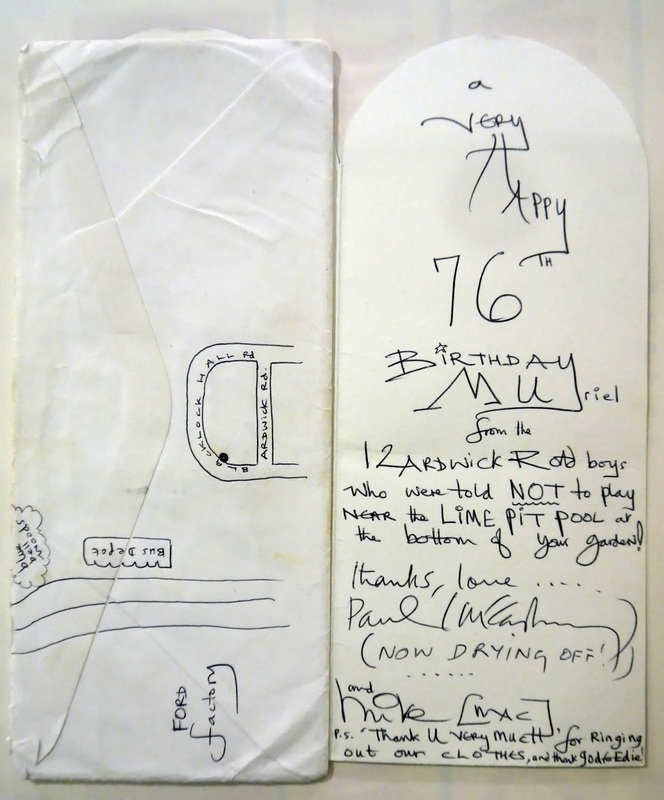 This birthday card was sent 50 years after their rescue and is mostly written by Mike and signed by both him and Paul. 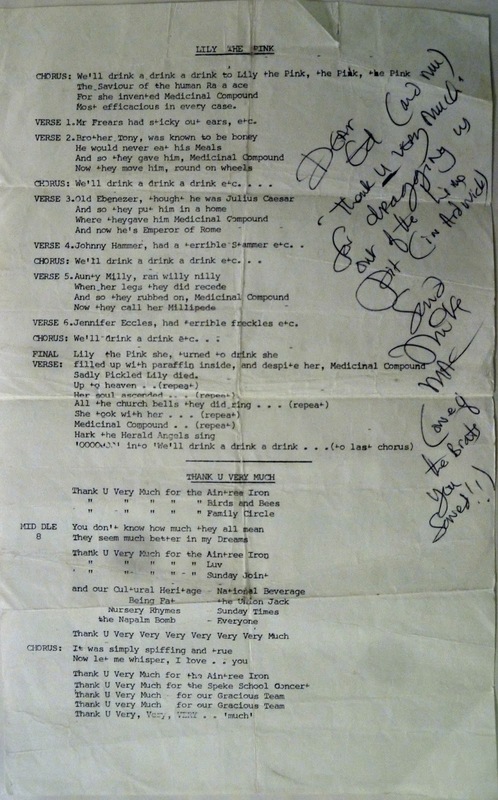 Mike as obviously very grateful as he also sent this lyrics sheet to Eddie (Muriel's husband) signing it as "one of those brats you saved"
Clicking the images will take you to bigger versions. 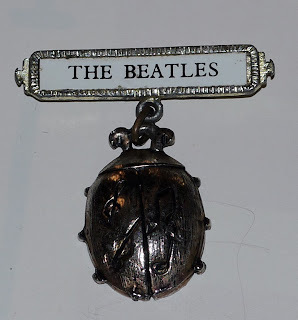 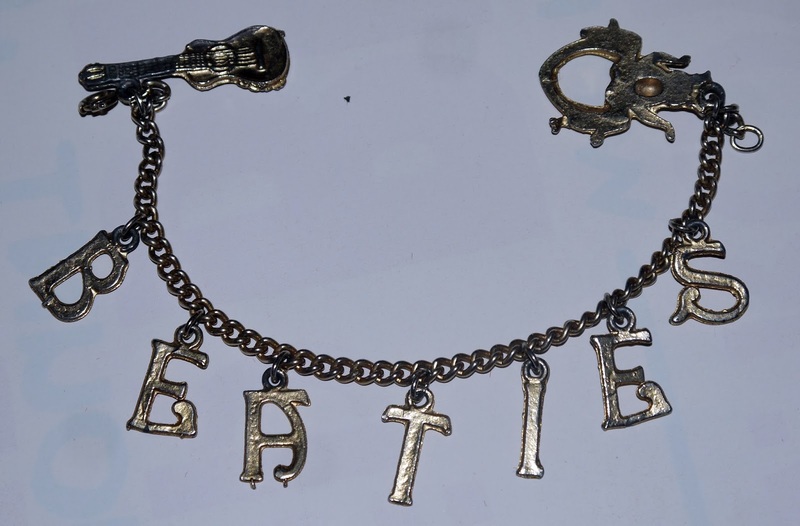 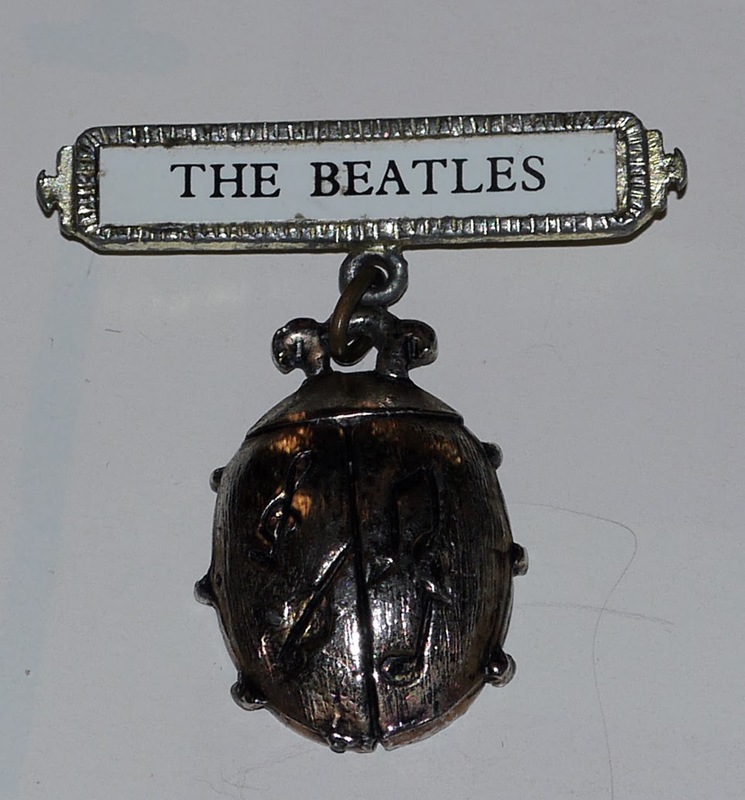 Both items will be up for sale in our 2014 Liverpool Beatles Auction next August. This Parlophone Records promotional card has been signed by three Beatles but there are four signatures because Ringo has signed Paul's name as well as his own. 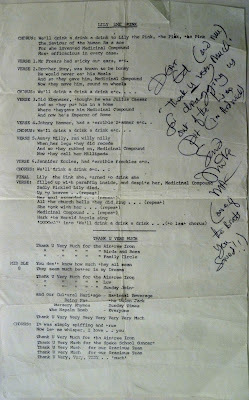 It wasn't unusual for them to sign each other names when things were handed in to sign. 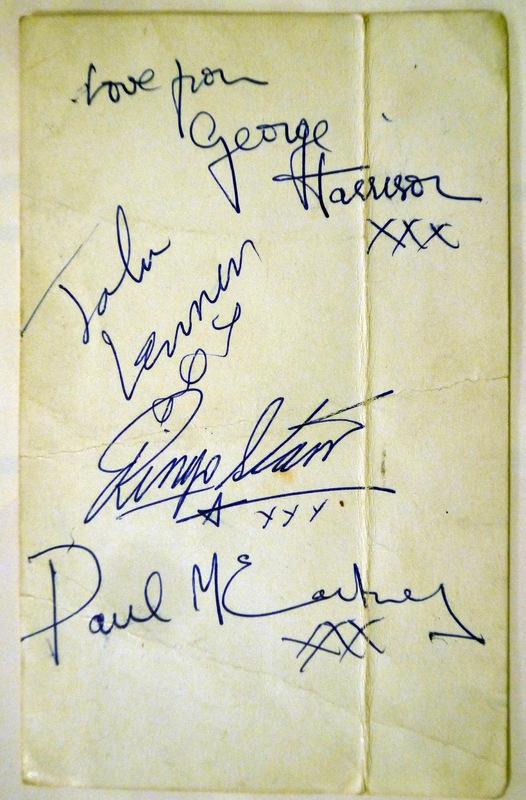 The card will be up for sale in our 2014 Liverpool Beatles Auction next August and is expected to sell for between £800-£900. These vintage photos of the Beatles capture the boys in less guarded moments than most published images. 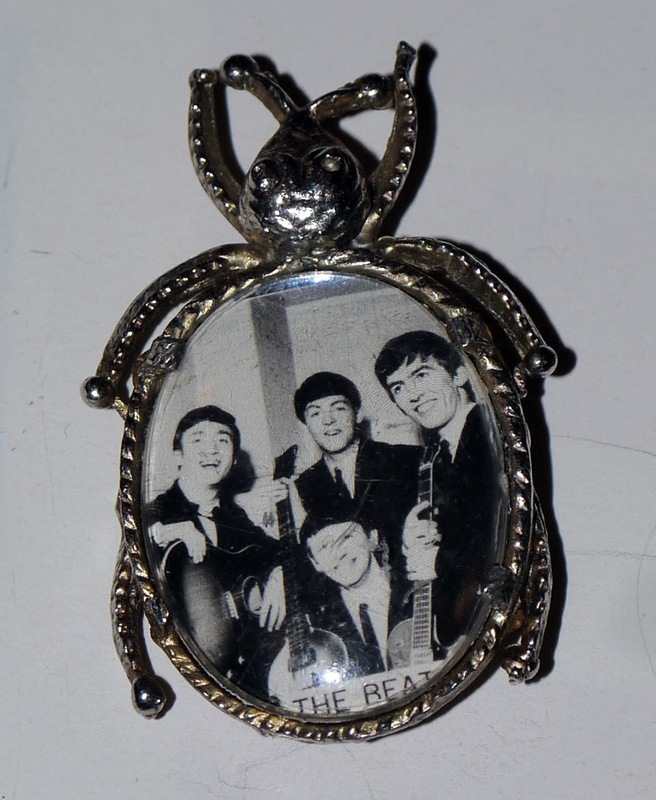 The photos were given to the vendor by the person who took the photographs and are not sold with copyright. 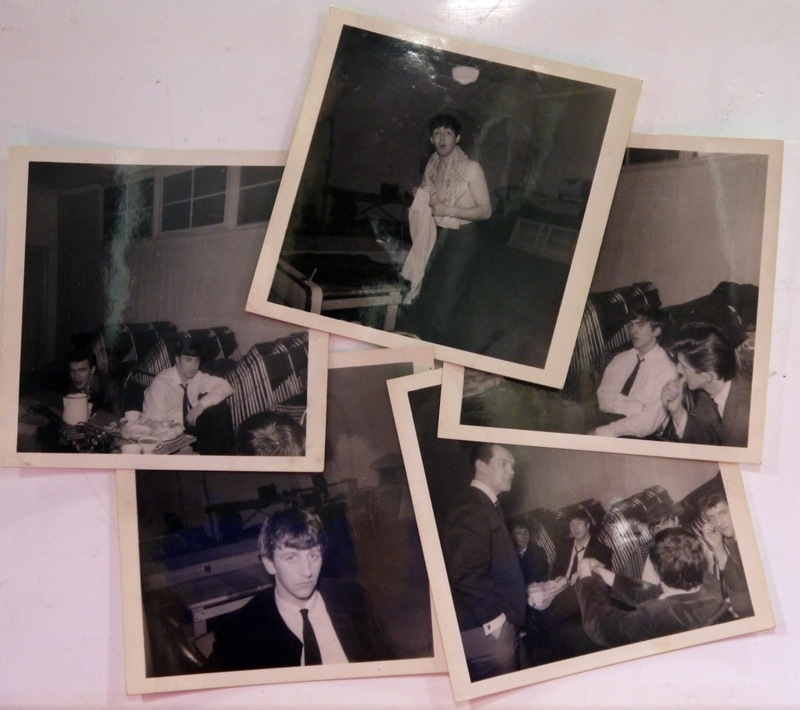 The estimate for this collection of five photographs is £250-£300. The Quarrymen famously recorded an acetate in the Phillips Studios at 38 Kensington, Liverpool. 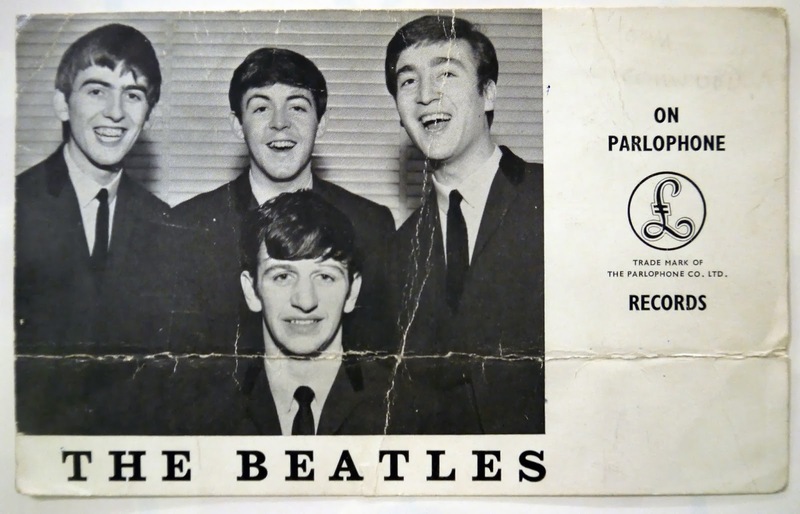 The door to this studio is now on display at the Liverpool Museum to celebrate all the famous faces that passed through it. 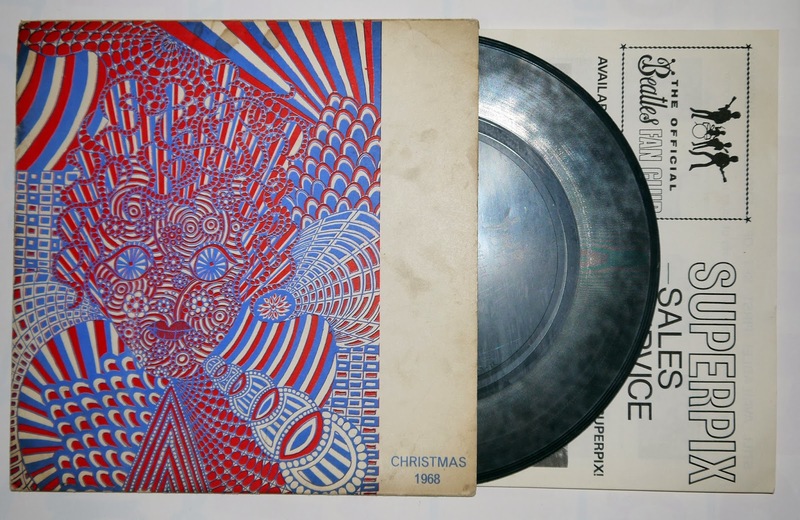 This card record sleeve from the studio will be up for sale in our 2014 auction and has an estimate of £30-£50. 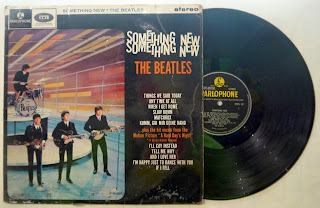 This export copy of Something New was purchased at the Burtonwood Airbase according to the vendor. 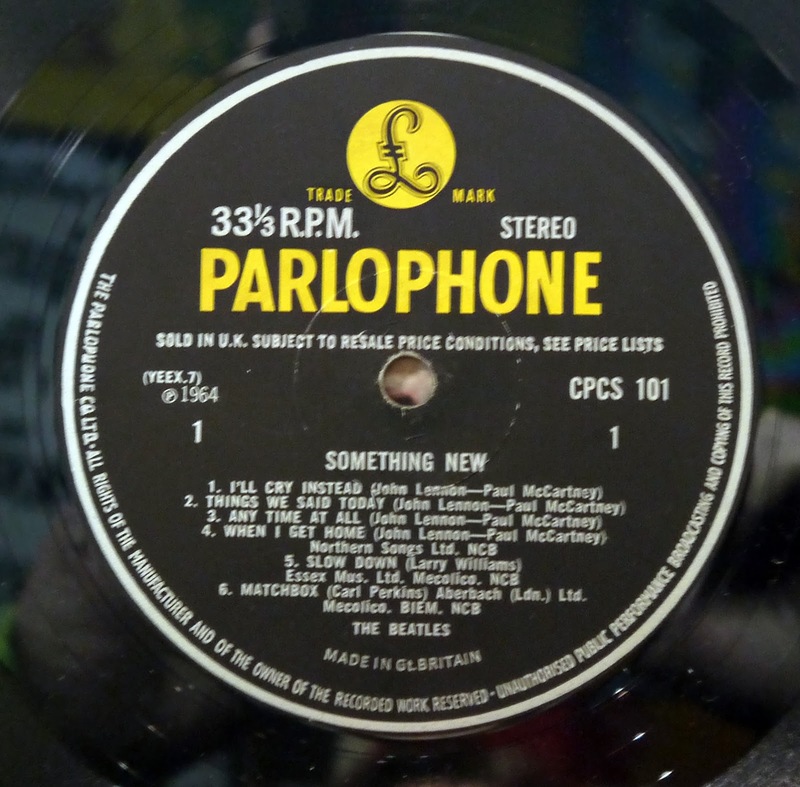 Most export releases were produced for sale on US air force bases throughout the UK and Europe. The "sold in the UK subject to..." wording on the label was a mistake at the time of manufacture. 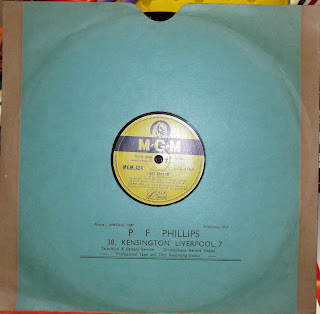 The record carries an estimate of £225-£275 and will be up for auction at our 2014 event. 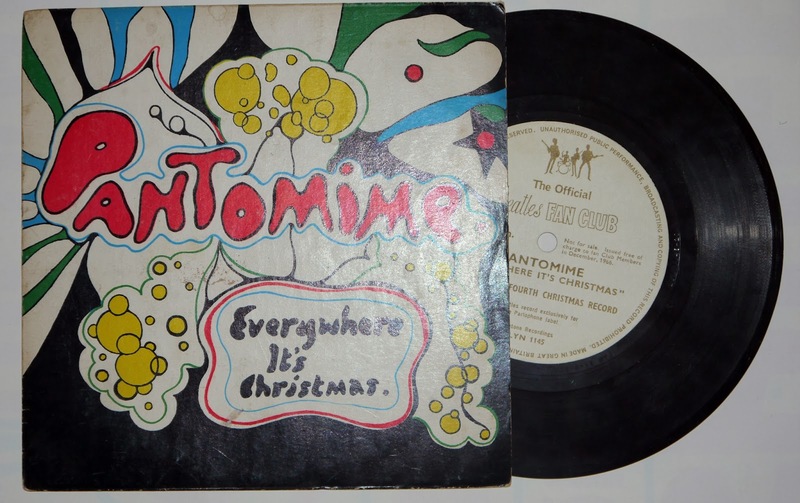 As the festive season approaches it seems fitting that our first post about items in the 2014 Auction is a bit Christmassy. 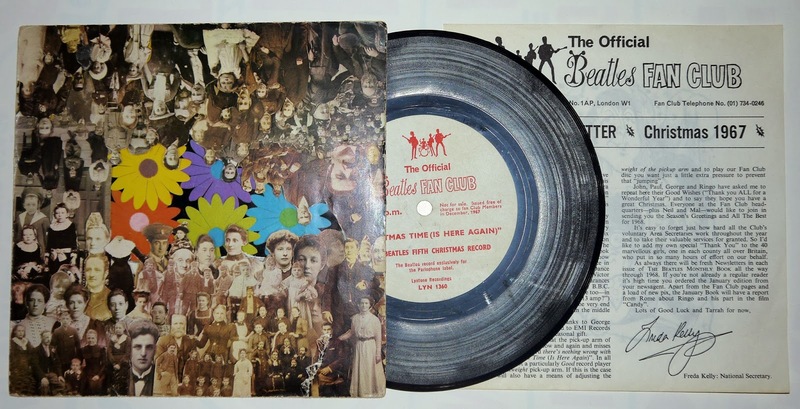 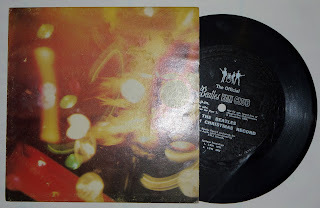 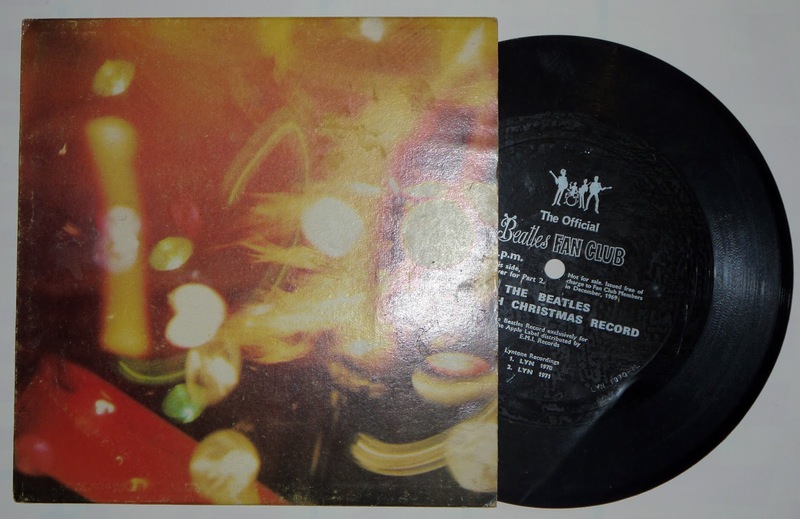 Every year the Beatles sent out a Christmas record to the members of their fan club. The records had specially recorded seasonal messages from the band.